Looking for a well-paying job in Colorado? Interested in politics? 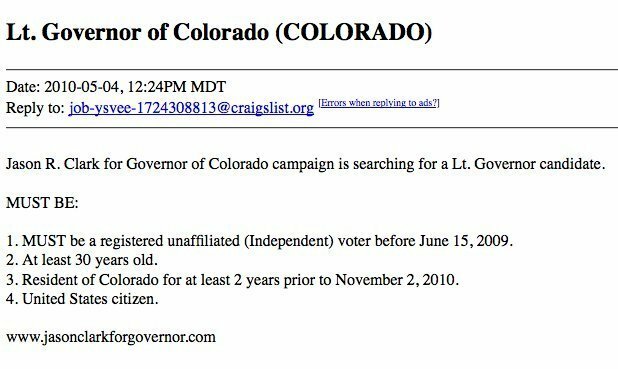 Job hunters perusing Craigslist for Denver-area job openings may be surprised to stumble upon a pretty prominent listing: Lieutenant Governor of Colorado. The posting, listed by independent gubernatorial candidate Jason Clark, mentions surprisingly few qualifications--mainly just those stipulated by the Colorado Constitution. Candidate must be at least 30 years old, a United States citizen, etc. The Lieutenant Governor has a salary of $68,500. Clark told 9news on Sunday, "We want to invite everybody in. We want the best and the brightest. We want some new ideas, new leadership. New paradigm. If you're out there and you think you might be interested in this area, give me a call. We'll interview you and put you on the list."